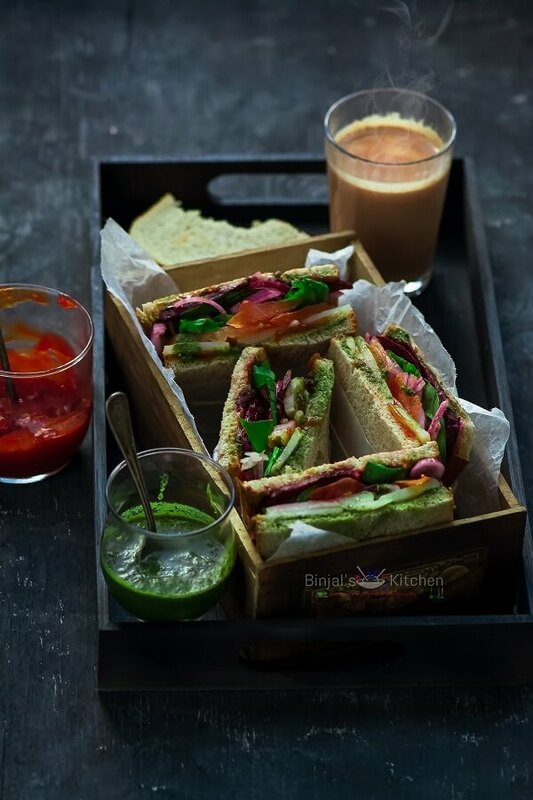 Bombay Sandwich or Indian Style Club Sandwich, is no fuss, quick and easy. 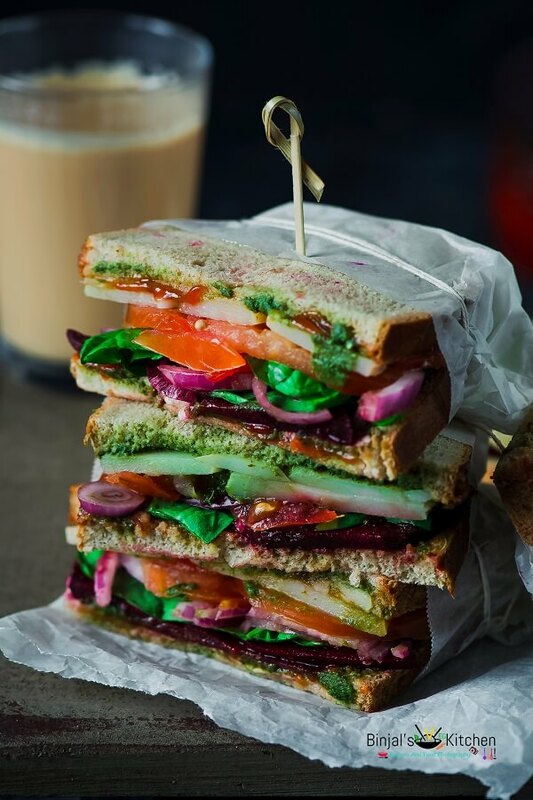 Bombay Sandwich is a healthy option. 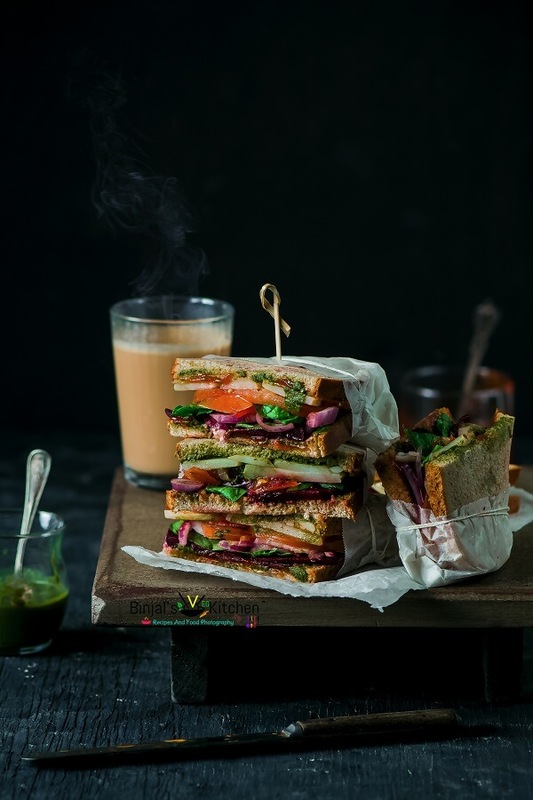 Bombay Sandwich is an instant breakfast.Bombay Sandwich is easy and simple to make it, even kids can make it their self. Bombay Sandwich can have it as a breakfast or as a brunch or lunch or dinner, its a best option for anytime hunger. It can be easily matched with any meal option with full satisfaction. There are so many varieties of sandwiches, like grilled, toast, but my fav is this. It’s simple, light, fresh, healthy, which fill you up without weighing you down. I love this kind of instant food, not only healthy, but also no fuss, no more work and full satisfaction. I made this version by adding fresh green spinach and veggies, and I’m absolutely in love! Craving a fast and healthy lunch? This simple sandwich packs a lot of flavor and nutrition, which makes it ideal for an easy weekday meal. 1. Remove the skin of boiled potatoes, onion, cucumber, and beetroot. 2. Now thinly slice/cut the all veggies except spinach and arrange all sliced veggies in one big plate. 3. Take 2 breads, and spread the melted butter on both breads on one side of the surface. 4. Apply or spread chutney on one bread and ketchup on another bread slice on top of the buttery side. Repeat the same process and make more slices. 5. Then place the potato, cucumber, onion, Bell pepper, beetroot and tomato slices over the chutney slices as per your choice. 6. Sprinkle some chaat masala, black pepper, salt and arrange some chopped spinach leaves over it. 7. Now place the ketchup slice over it, then press it lightly/gently with your hand and cut it into halves, or cross whatever pieces you want. 8. Bombay Sandwich is ready, serve it with extra ketchup and chutney and enjoy it with breakfast, meal, lunch, dinner or with a cup of tea. • You can add or skip any veggie as per your choice. • You can grill or toast this sandwich as per your choice. • You can add grated cheese as per your choice. 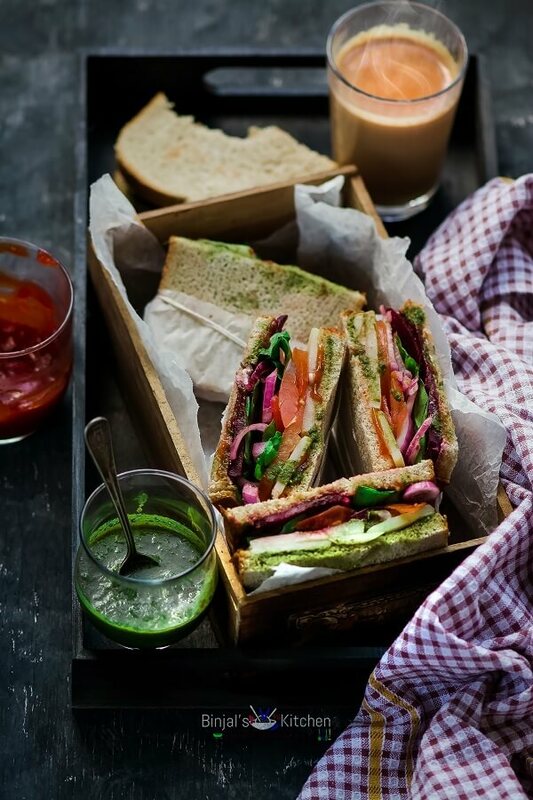 Bombay Sandwich or Indian Style Club Sandwich, is a perfect no fuss, quick healthy option for anytime hunger. Bombay Sandwich is an instant breakfast. Bombay Sandwich is easy and simple to make it, even kids can make it their self. Bombay Sandwich can have it as a breakfast or as a brunch or lunch or dinner. It can be easily matched with any meal option with full satisfaction. There are so many varieties of sandwiches, like grilled, toast, but my fav is this. It’s simple, light, fresh, healthy, which fill you up without weighing you down. Remove the skin of boiled potatoes, onion, cucumber, and beetroot. Now thinly slice/cut the all veggies except spinach and arrange all sliced veggies in one big plate. Take 2 breads, and spread the melted butter on both breads on one side of the surface. Apply or spread chutney on one bread and ketchup on another bread slice on top of the buttery side. Repeat the same process and make more slices. Then place the potato, cucumber, onion, Bell pepper, beetroot and tomato slices over the chutney slices as per your choice. Sprinkle some chaat masala, black pepper, salt and arrange some chopped spinach leaves over it. Now place the ketchup slice over it, then press it lightly/gently with your hand and cut it into halves, or cross whatever pieces you want. Bombay Sandwich is ready, serve it with extra ketchup and chutney and enjoy it with breakfast, meal, lunch, dinner or with a cup of tea.